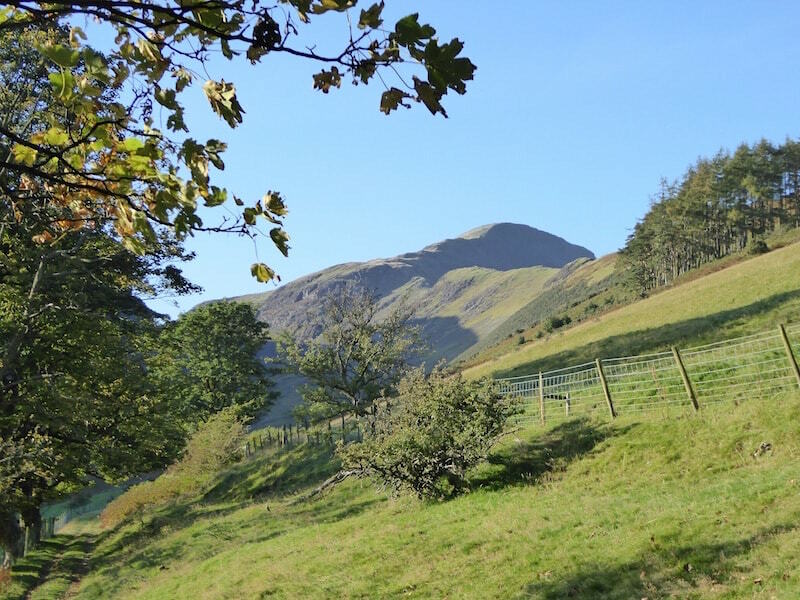 The good weather continues thanks to the high pressure system which is still sitting over the country, so we drove over to Little Town in the Newlands Valley for a walk up to Robinson and Dale Head. 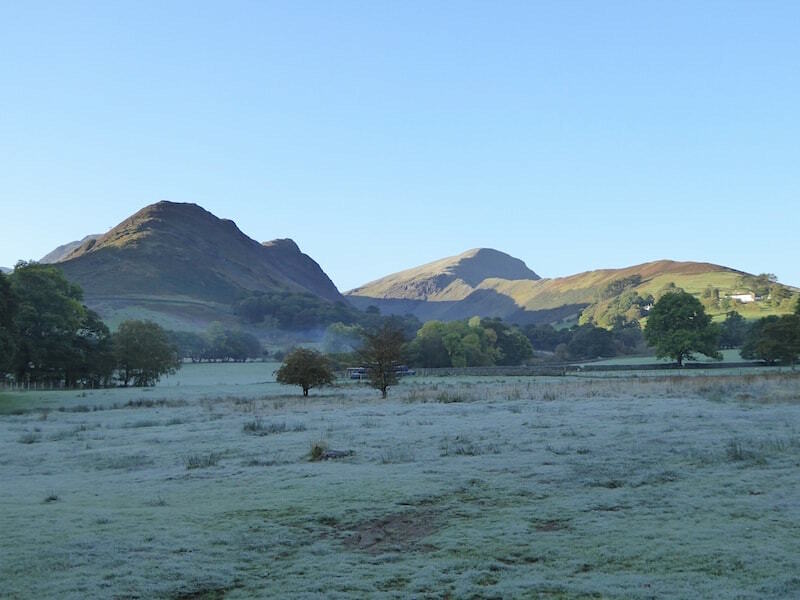 Another clear bright morning, plenty of blue sky and sunshine but there was frost on the fields and the temperature down at freezing level in the shade as we started out. 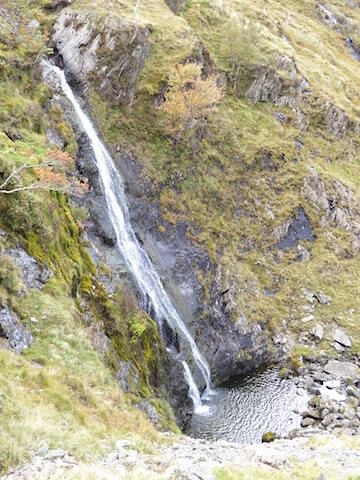 Fleeces, jackets, hats and gloves were on to begin with as we would be walking up alongside Scope Beck which would be in the shadow of Hindscarth for most of the way up to the reservoir. The sun was already high enough for Robinson, on the right hand side, to be getting the benefit so we knew once we had passed by the reservoir we would also be in the sunshine. 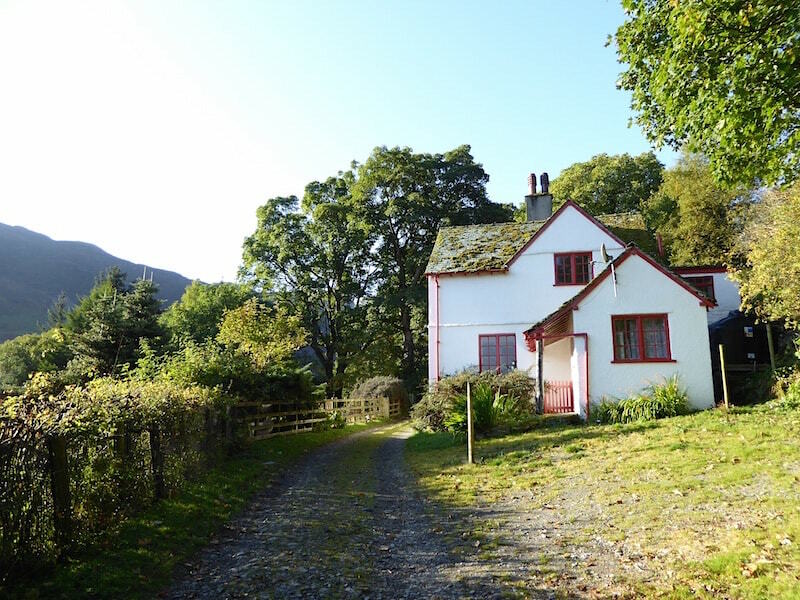 Holiday cottage alongside the footpath below High Snab. Shouldn’t Eric Morecambe be standing here? Walking along the path above Scope Beck towards Robinson. A look back down the valley. 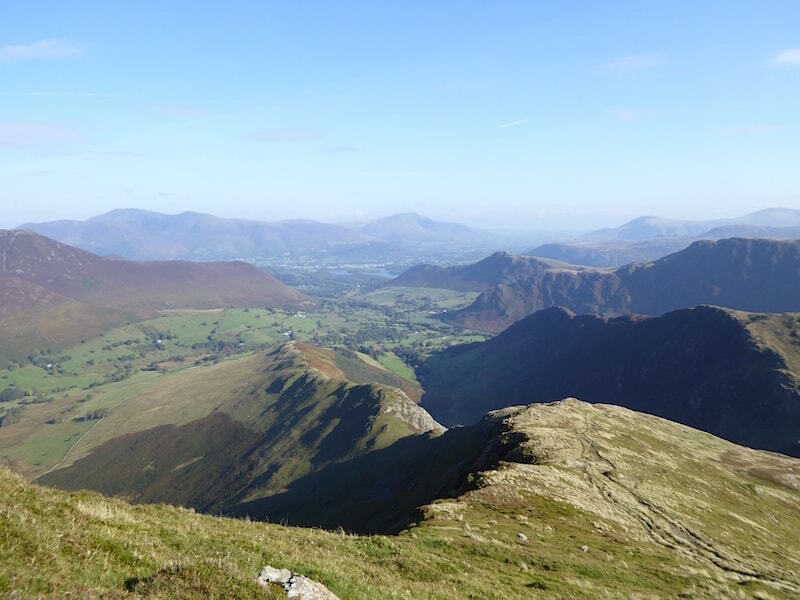 Catbells is in shadow on the right with Blencathra just behind it. 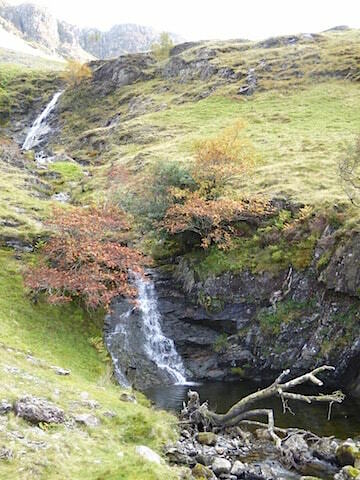 We’re still walking above Scope Beck which you can see down on the left. 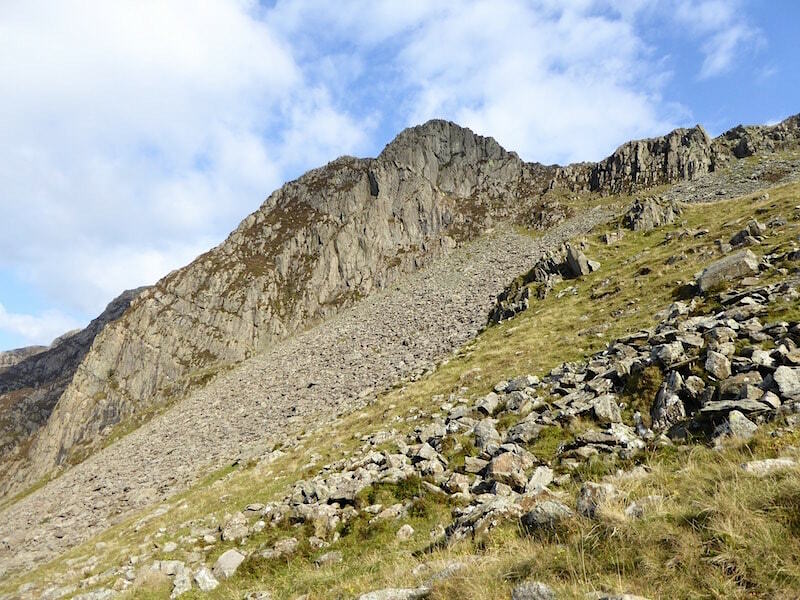 This is a lovely route, the path rises gently through a quiet valley, and it doesn’t feel like you’re having to put in much effort for the height you are gaining. Another look back as we gain more height. Hindscarth is still casting its shadow so its a bit nippy down here. The path takes us alongside Scope Beck reservoir where a couple of sheep are having breakfast on the dam wall. 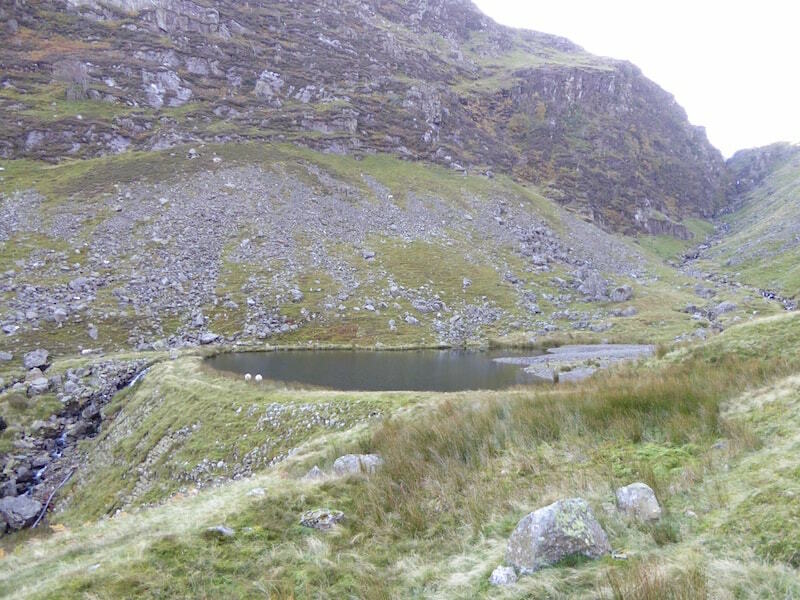 Another view of the reservoir as we continue along the path. 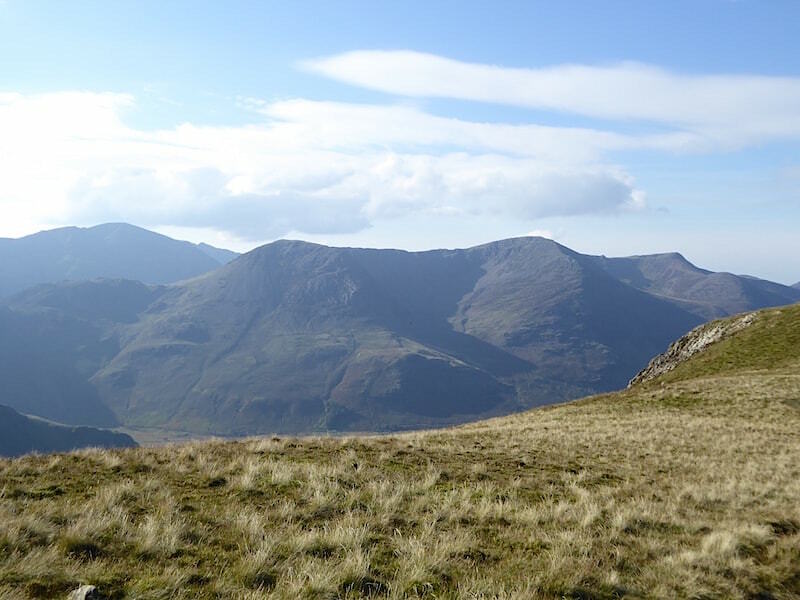 Looking ahead to Blea Crag which forms part of Robinson. No, we’re not climbing up that. The path passes below it and then branches off to the right a little way beyond it. 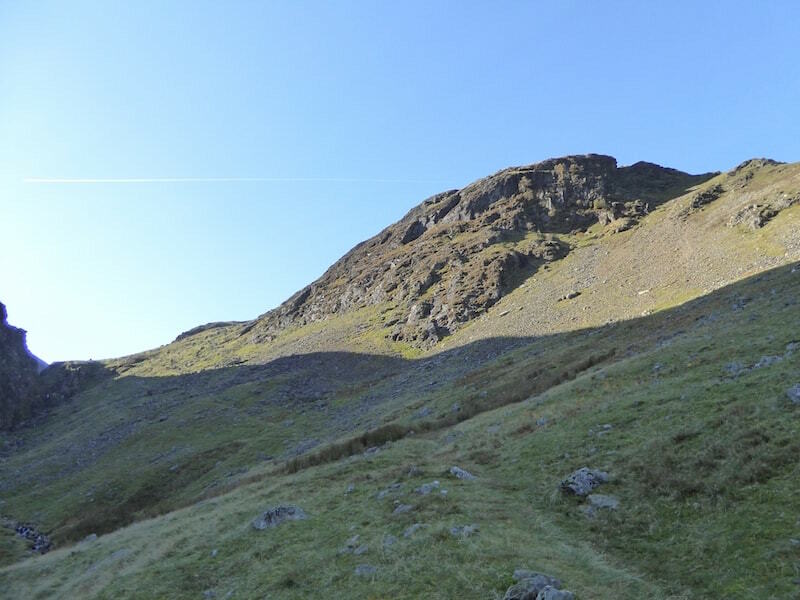 We climbed higher and so did the sun, and at last we are out of Hindscarth’s shadow. Ahead of us is Littledale. 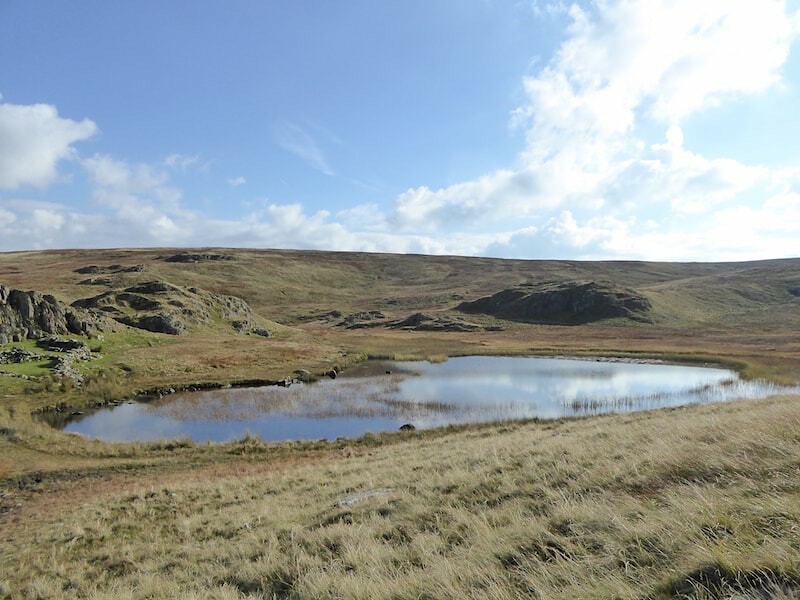 The long sweep on the skyline is Littledale Edge which we’ll be walking across later on. We’re now climbing out of Littledale and making for the main ridge path which comes up from High Snab Bank. 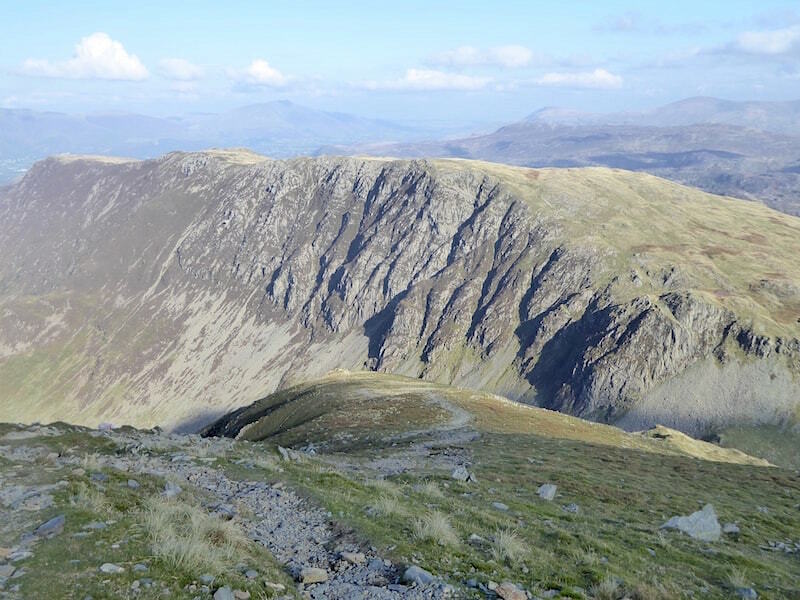 From here we’re looking straight across at Hindscarth, behind it is the Maiden Moor – High Spy ridge, and on the horizon are the Dodds and the Helvellyn range. 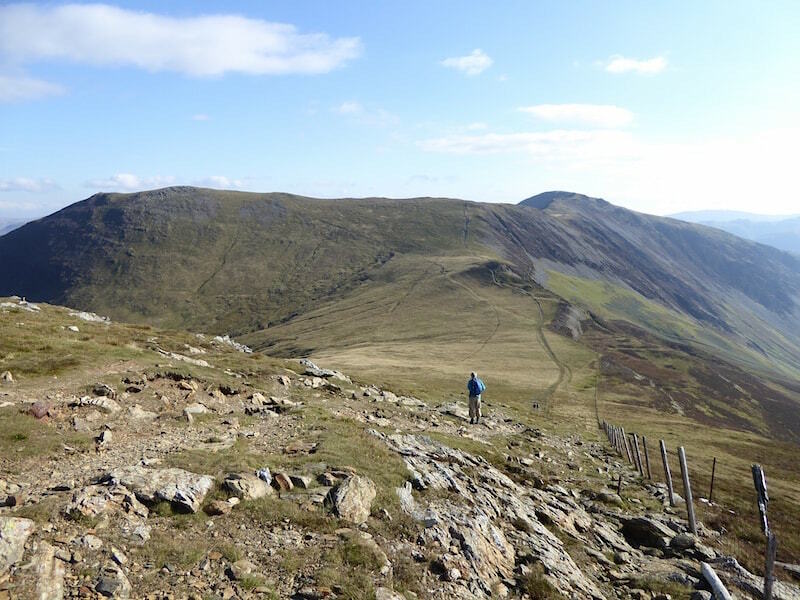 We’ve now joined the main path which comes over High Snab Bank, that’s the long ridge below us, and Blea Crag, where the path looks as though it just drops off over the edge. 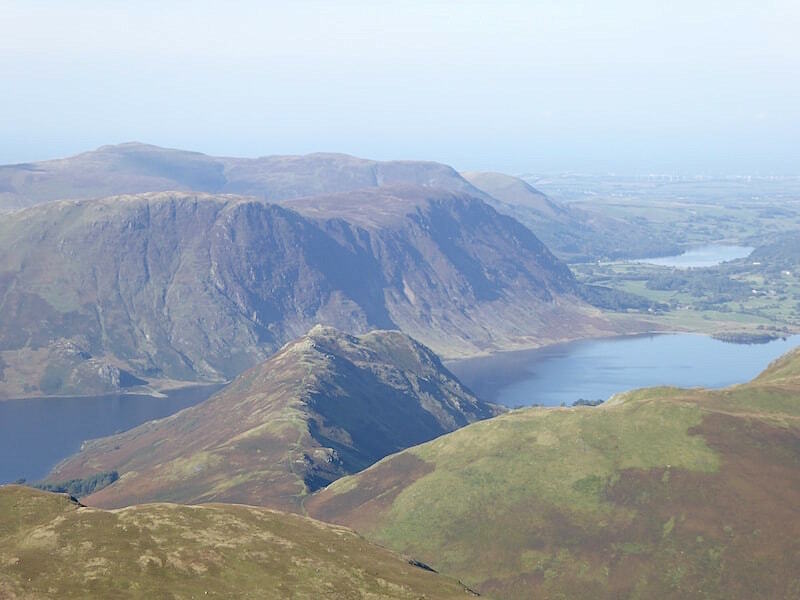 Continuing up Robinson we get a view of Crummock Water. 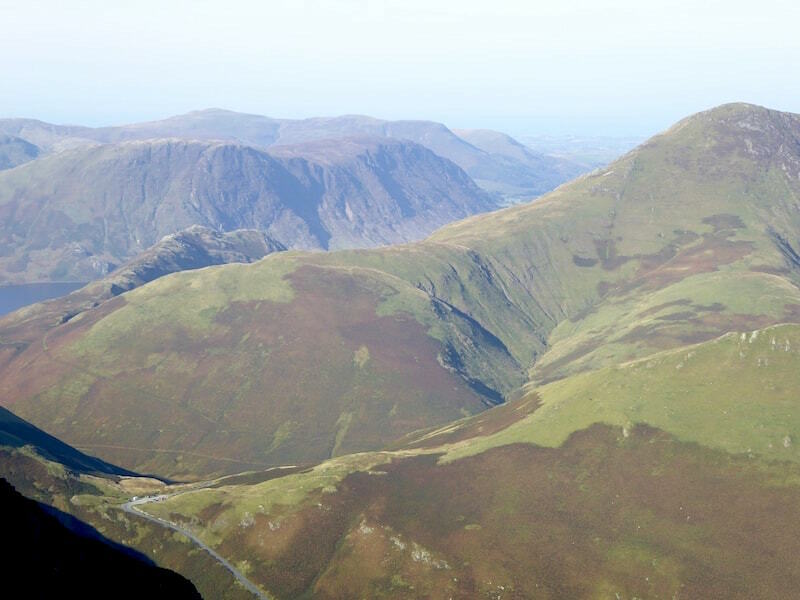 The bend in the road down there is Newlands Hause which has a number of cars parked down there today. 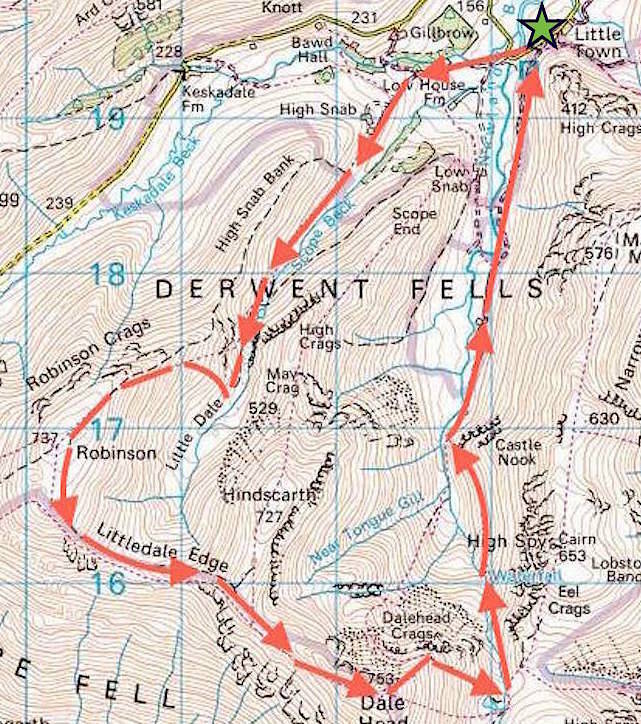 That’s the start of another route up Robinson. 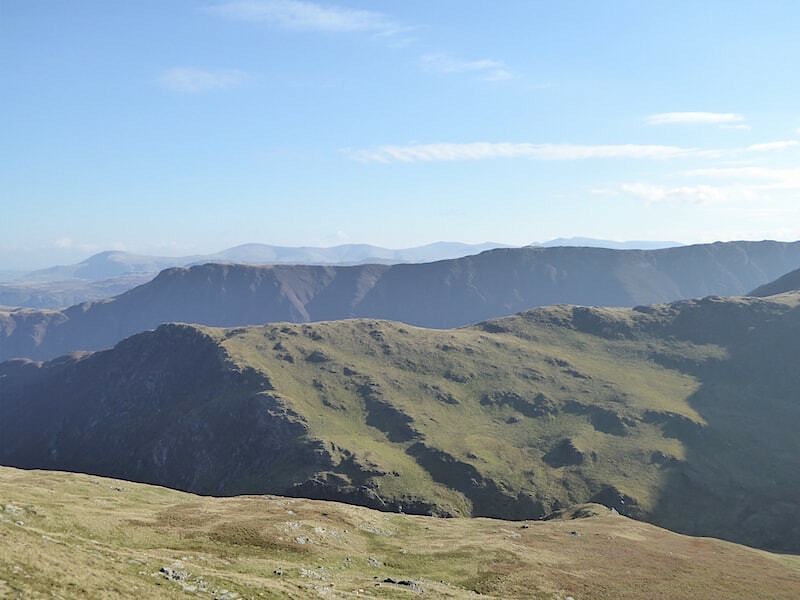 Plenty of fells on view from here. 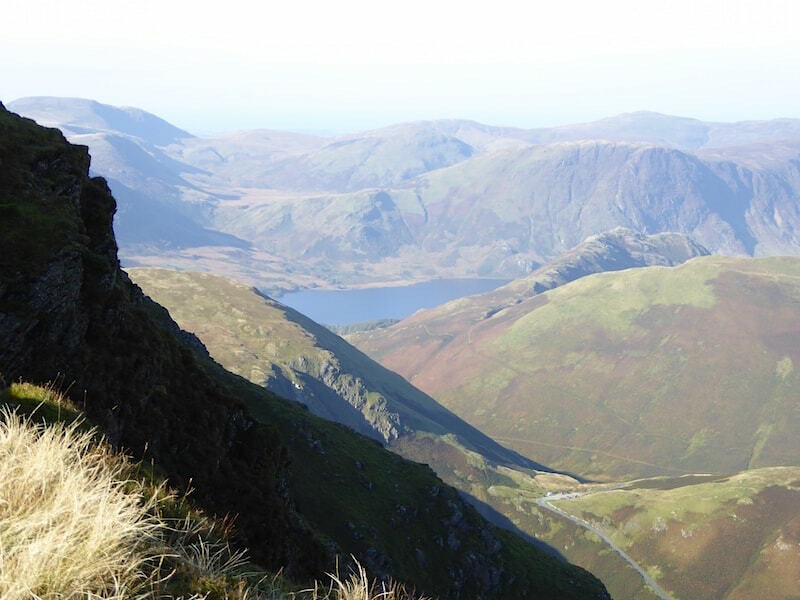 The nearest one is Whiteless Pike. 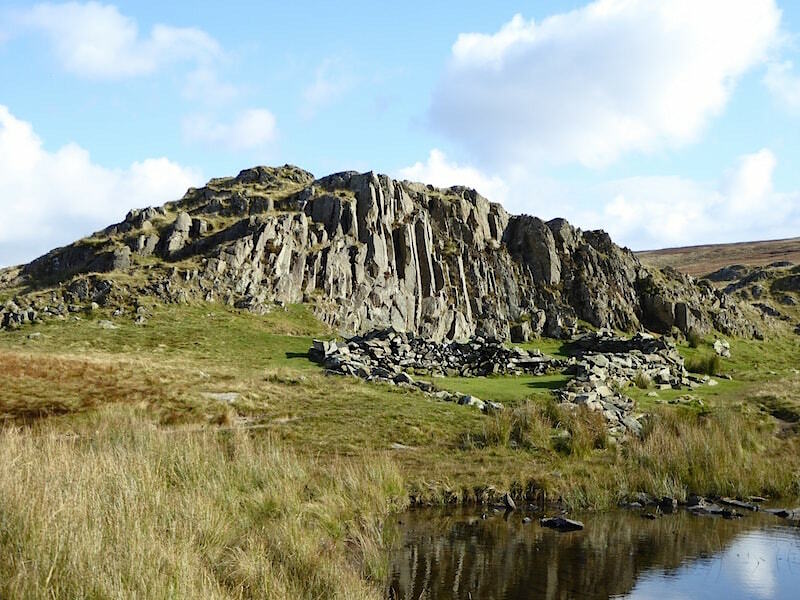 The little rocky one in the middle is Rannerdale Knotts, and behind that is Mellbreak. 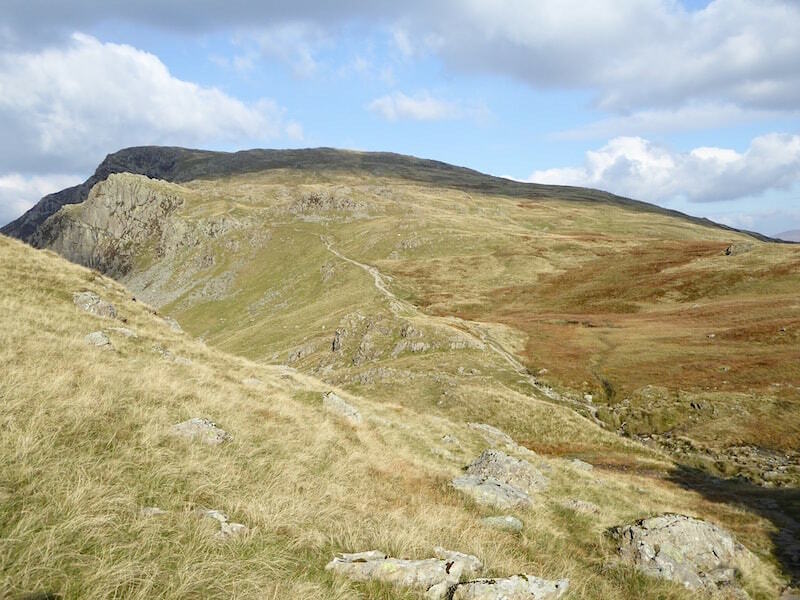 Whiteless Pike is now on the left and leads up to Wandope on the right. 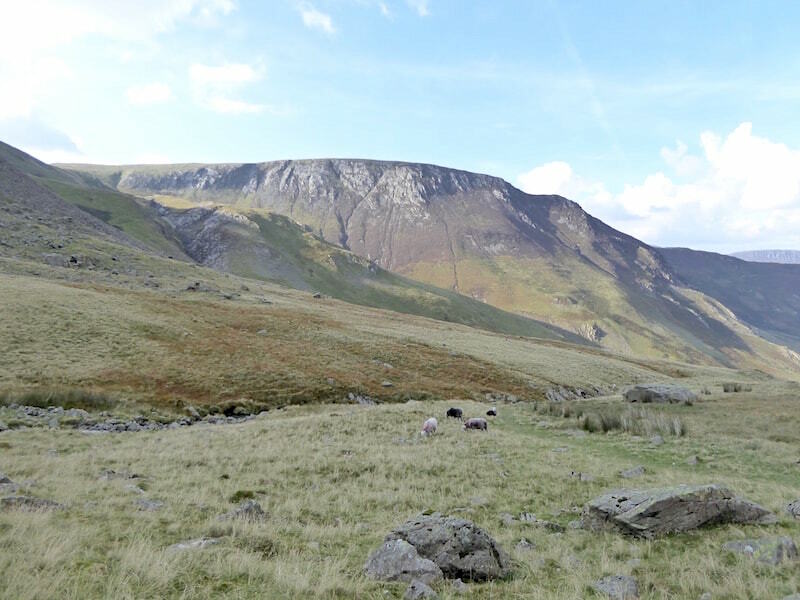 Behind both of them is Grasmoor. 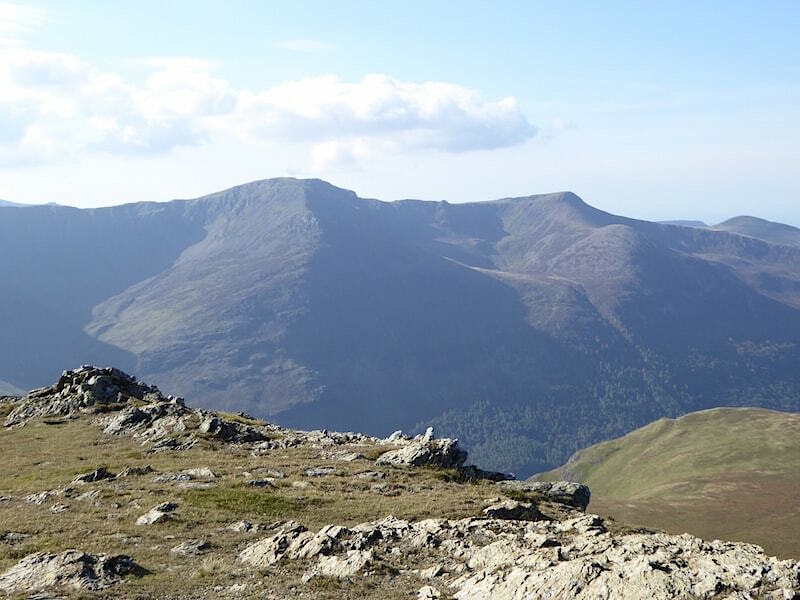 Moving a little to the right and now Crag Hill is on the left with its ridge leading down to Sail, while over on the far right is Grisedale Pike. 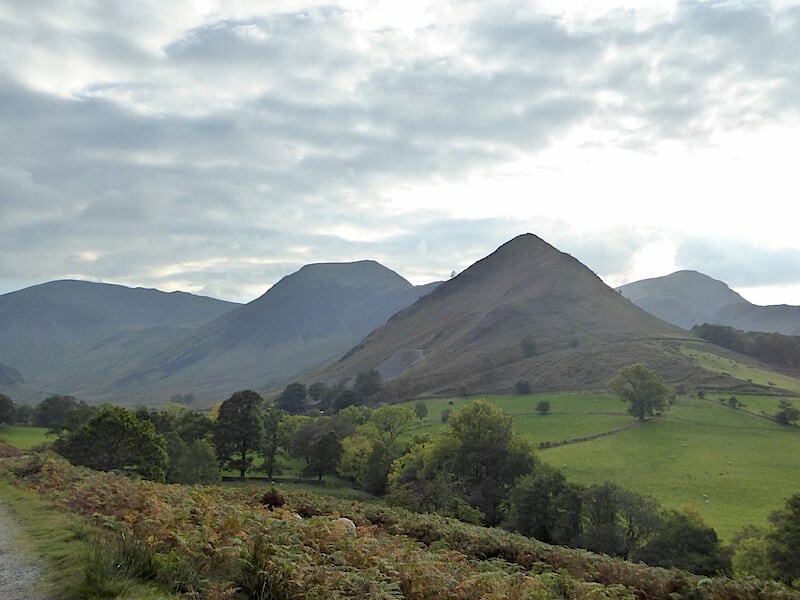 Moving even further to the right now and we have Scar Crags to the left, which leads on to Causey Pike on the right. 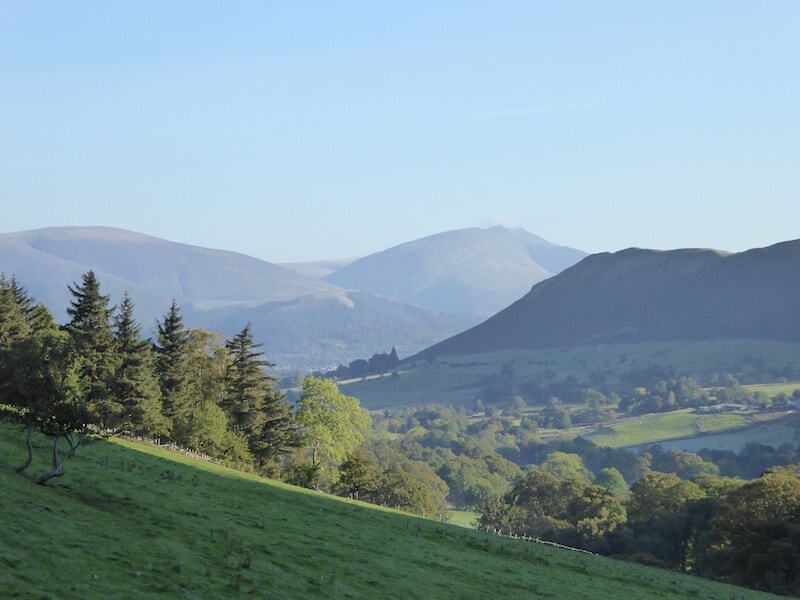 From the same spot but now looking northwards over the vale of Keswick. You certainly get a lot of view for your money up here. 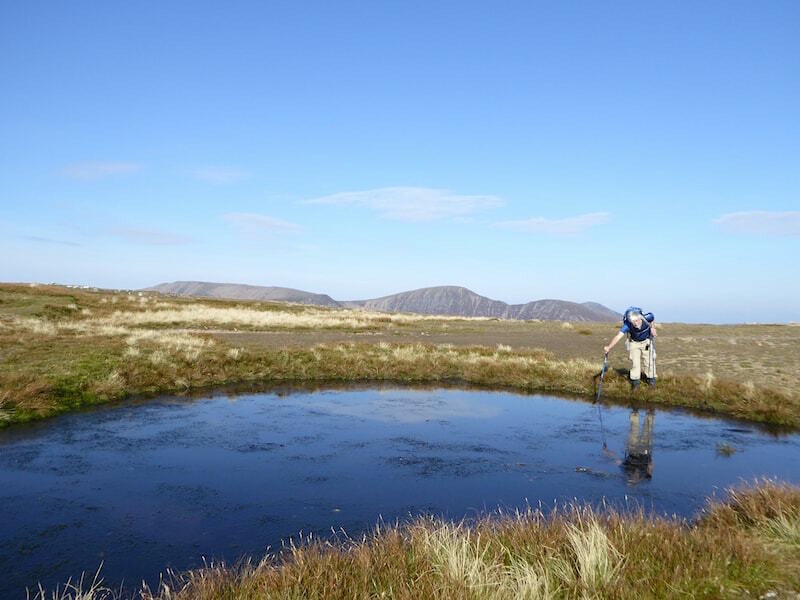 On the broad plateau of Robinson now and the man from the water company is checking the water level. Only joking, he doesn’t really work for a water company. Notice that fleeces, jackets, hats and gloves are no longer required. Its warmer than it was in summer. I’m about to have a rant here so those of you of a nervous disposition may wish to skip this bit. This is Robinson summit, atop which is a wind shelter, not needed today because there wasn’t much. However it had been utterly taken over by a person with a huge amount of radio equipment and an aerial longer than a fishing rod, not visible as they’ve been edited out. Also present, his female companion, frosty in appearance and manner. They weren’t so much summit hogging as summit squatting and looked as though they were there for the day. The fact that several people were present trying to take photos made no difference to him, ‘Major Tom’ kept wittering on to ‘Ground Control’ about absolutely nothing at all, selfish b****r! People make the effort to walk up and then can’t get a decent photo because of people like him. Where’s your manners mate? Set your stuff up clear of the summit and let other folks get a look in. Its a National Park, that means it belongs to all of us, its not your personal fiefdom. I get really angry about this sort of thoughtlessness. End of rant. I moved away from the source of my irritation and concentrated on photos instead. 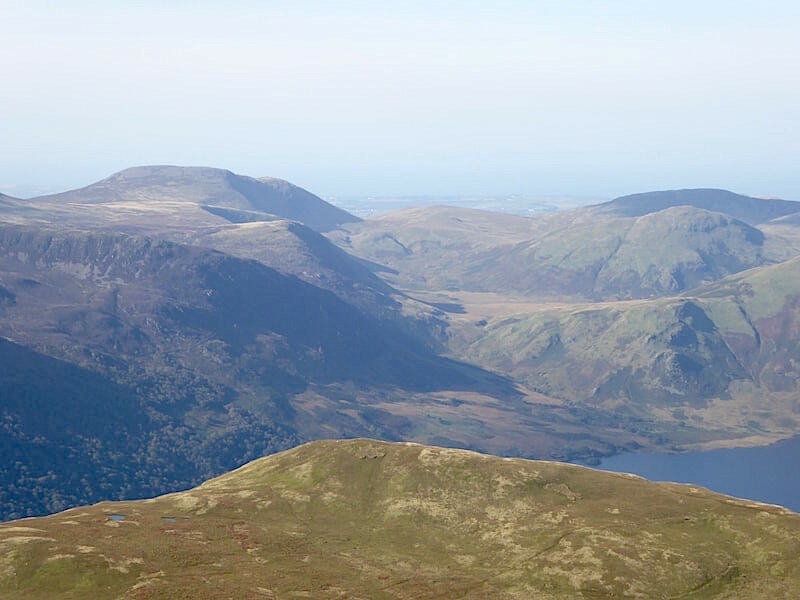 Directly opposite is High Stile on the left and Red Pike on the right. 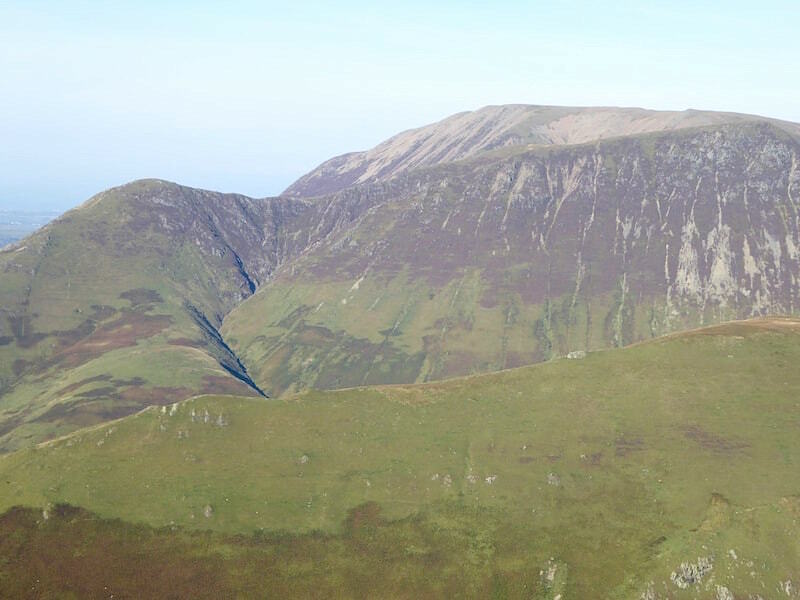 No view of the coast today but on the left skyline is Great Borne, and the long fell to the right of it is Hen Comb. 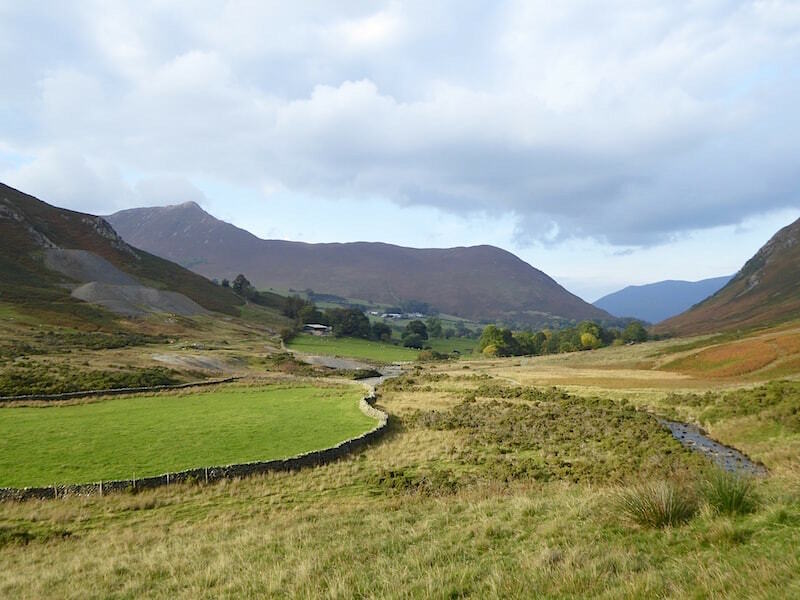 Rannerdale Knotts jutting out towards Mellbreak and looking as though its sliced Crummock Water in two. 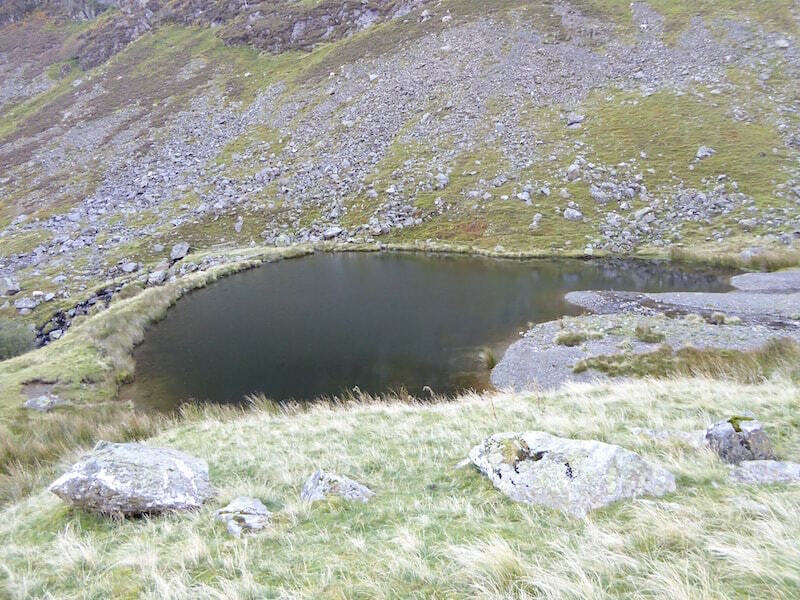 The other body of water is Loweswater. Leaving Robinson and heading down to Littledale Edge. 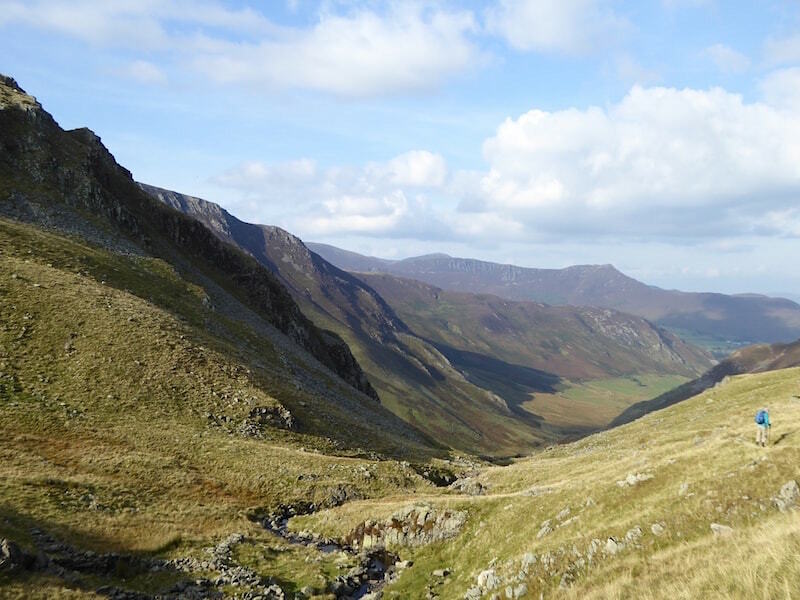 The long flat topped fell on the left is Hindscarth but we are heading for the one beyond it which is Dale Head. 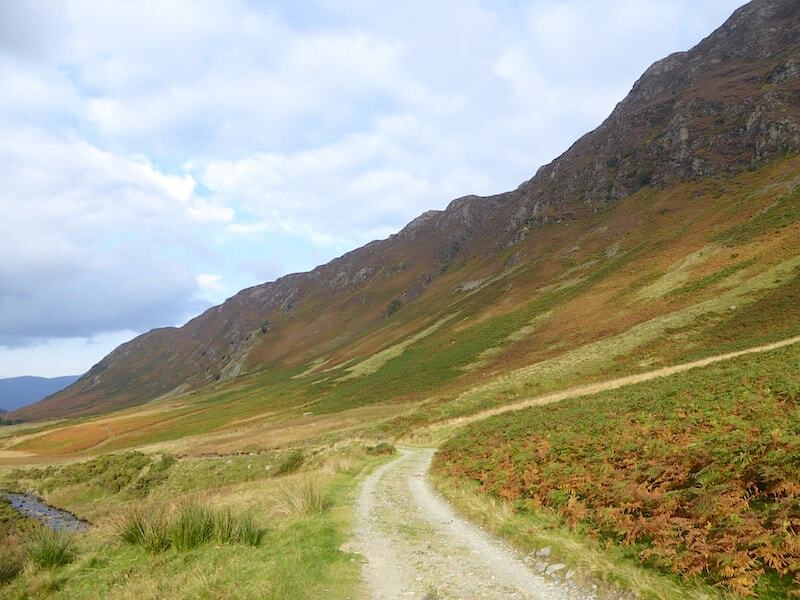 Continuing along Littledale Edge towards Hindscarth and Dale Head. 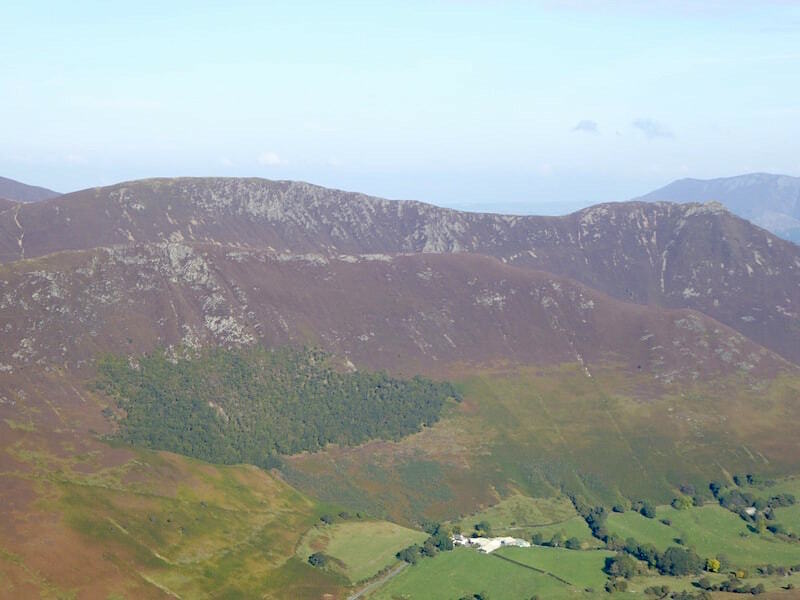 From Littledale Edge a look across to the High Crag – High Stile – Red Pike ridge. 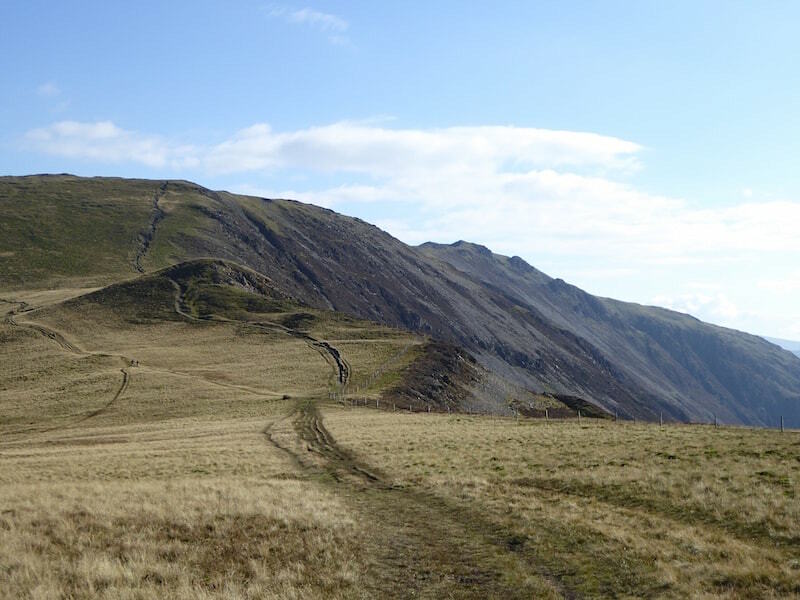 Over on the left skyline is Pillar. 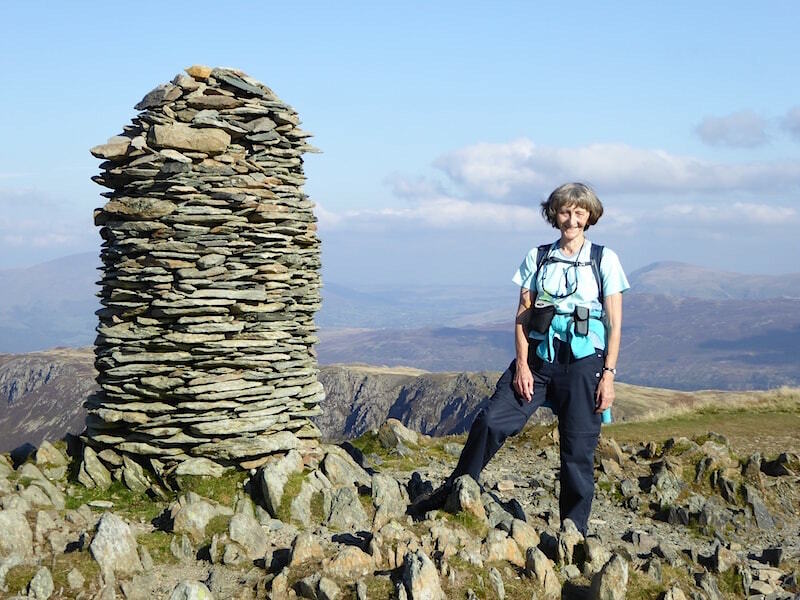 There’s still a bit more ‘up’ to go before we reach Dale Head summit. That’s it on the left in the shade. 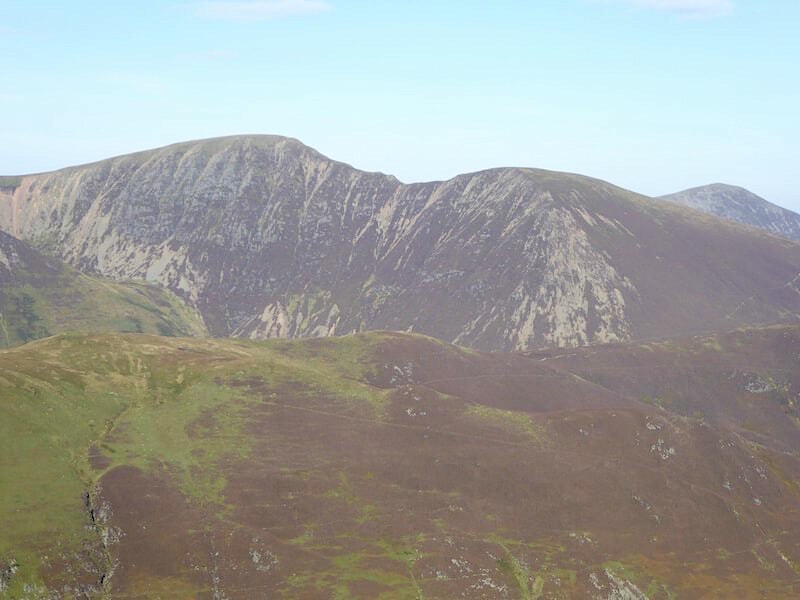 If you zoom in you’ll see the large summit cairn. 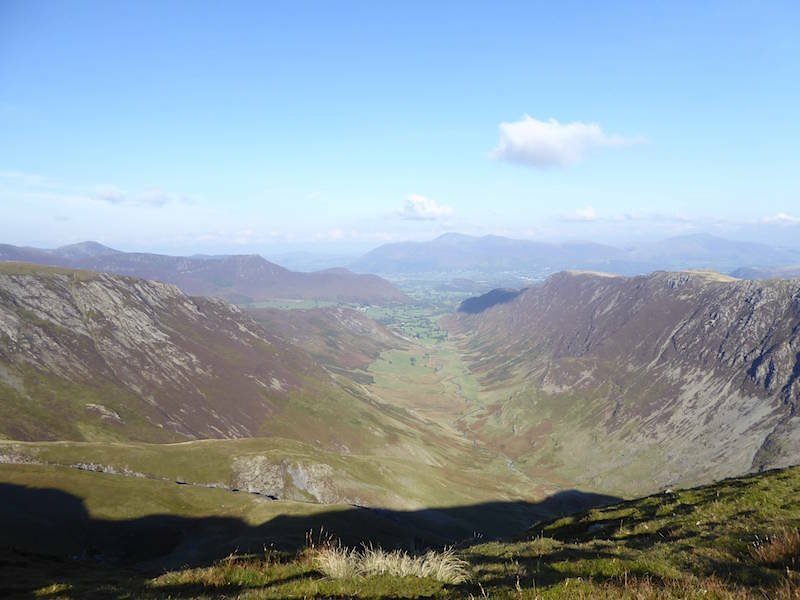 Almost at the summit of Dale Head and looking over the Newlands Valley. 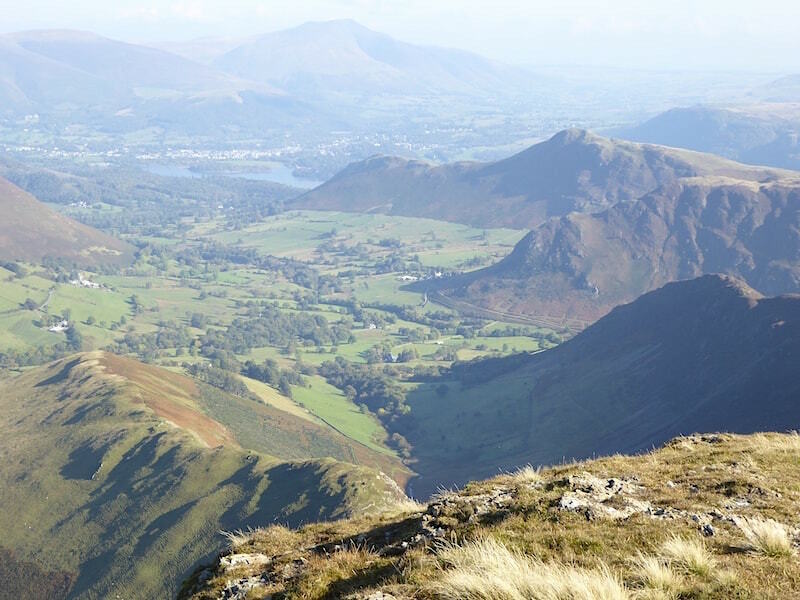 On the left is Hindscarth, on the right the crags of High Spy, and sitting under the little cloud in the centre is the Skiddaw range. 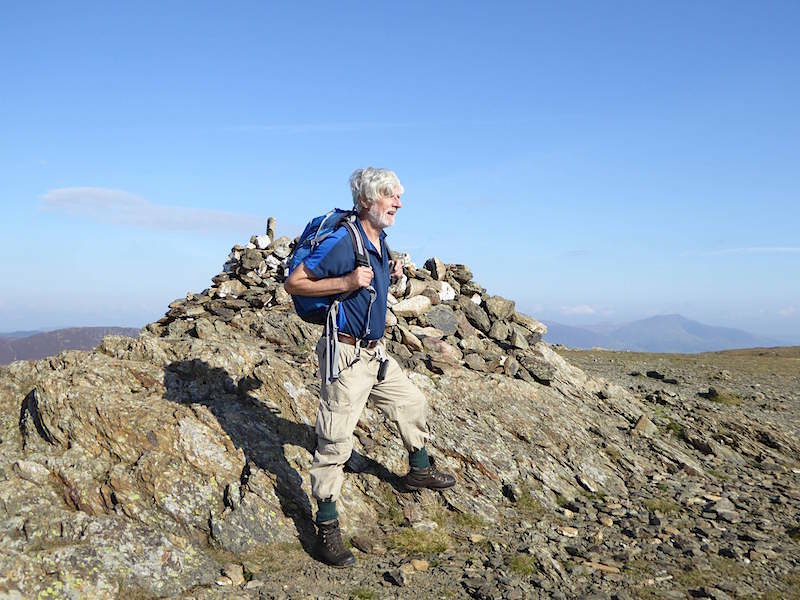 The splendid cairn on Dale Head. As we haven’t eaten since breakfast at 7.30 am and its now 1.40 pm I think we are due a spot of lunch. 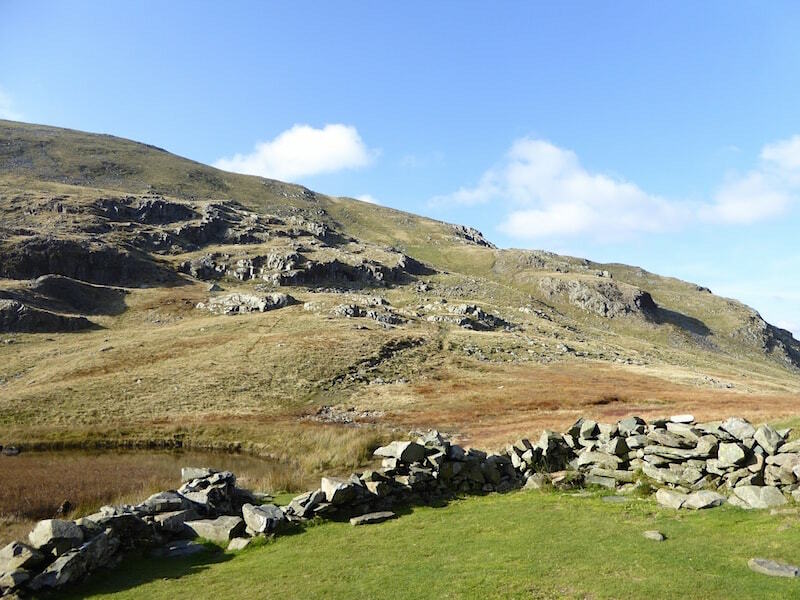 We decide to have something to eat at the sheepfold beside Dale Head Tarn, so off we go down Dale Head, with the crags of High Spy across from us. 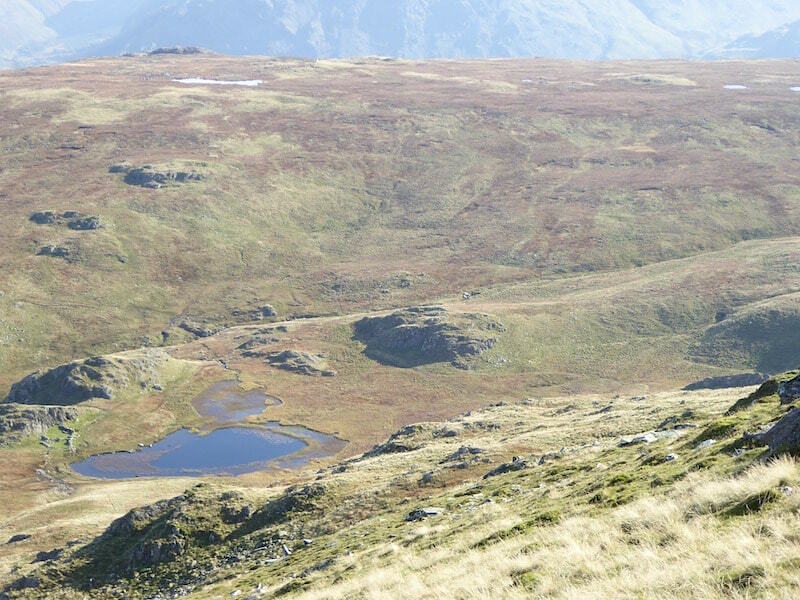 Down there is Dale Head tarn with the sheepfold beside it, that’s booked for lunch if the table is still available when we get there. Its now 2.15 pm so lunch is a little late. 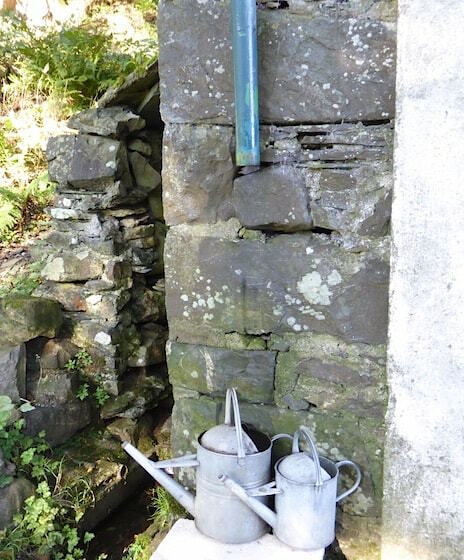 From our pool side table we tuck in and watch other walkers coming and going on the Dale Head path, their voices carrying clearly across the still air. 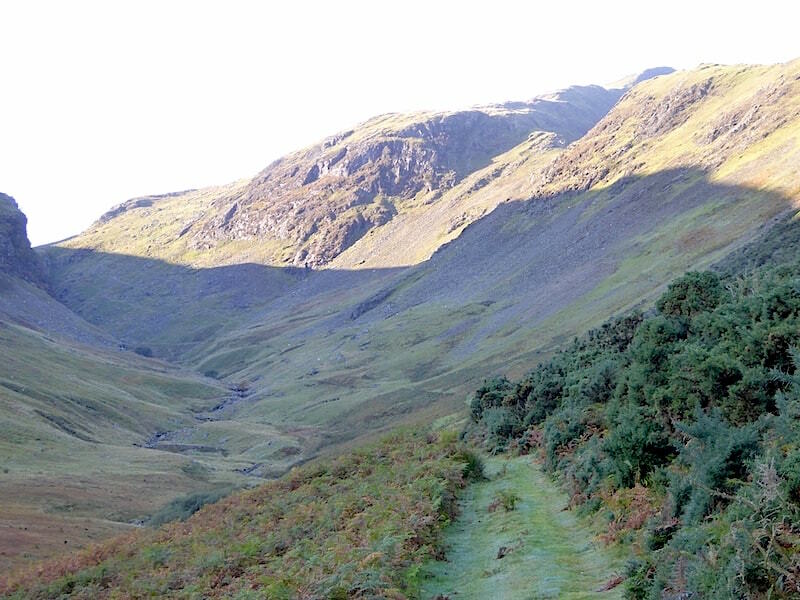 After lunch we take the path which will take us down to the Newlands Valley. Its not that one over there, that would take us up to High Spy and we’re not going there today. We’ll be going through the gap in the middle. 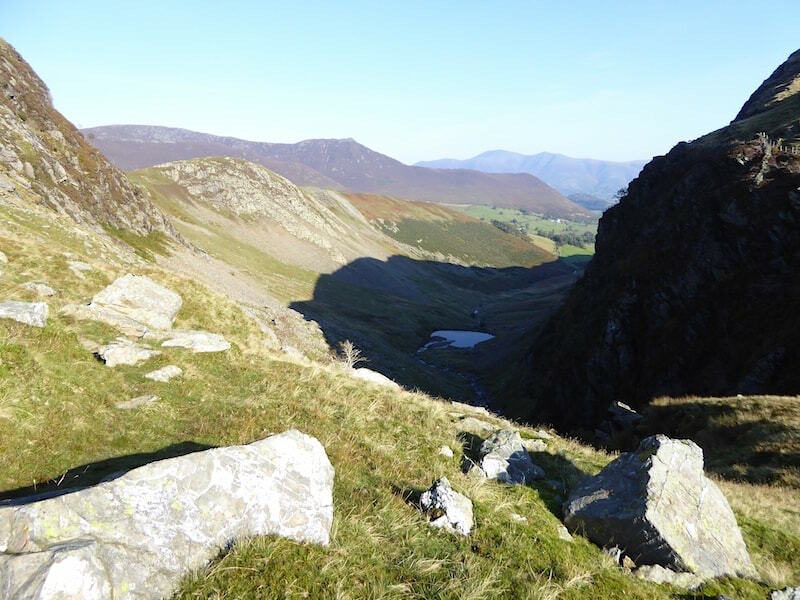 The path keeps company with Newlands Beck as we begin to descend into Newlands Valley …..
….. passing below the scree, crags and boulders of High Spy. 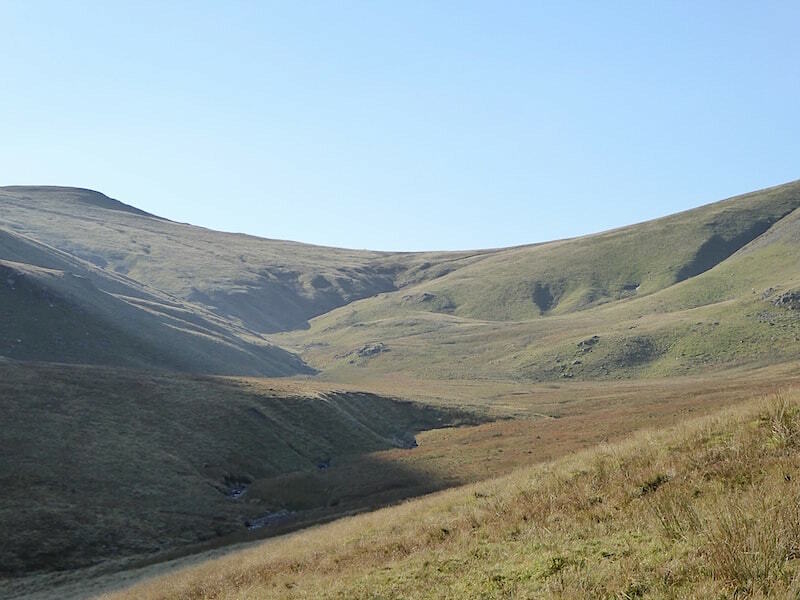 Across the valley is the flat topped Hindscarth. 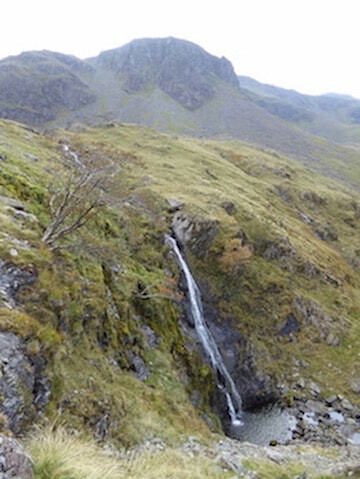 Between us and Hindscarth is Newlands Beck which is about to descend into the valley via a series of falls. 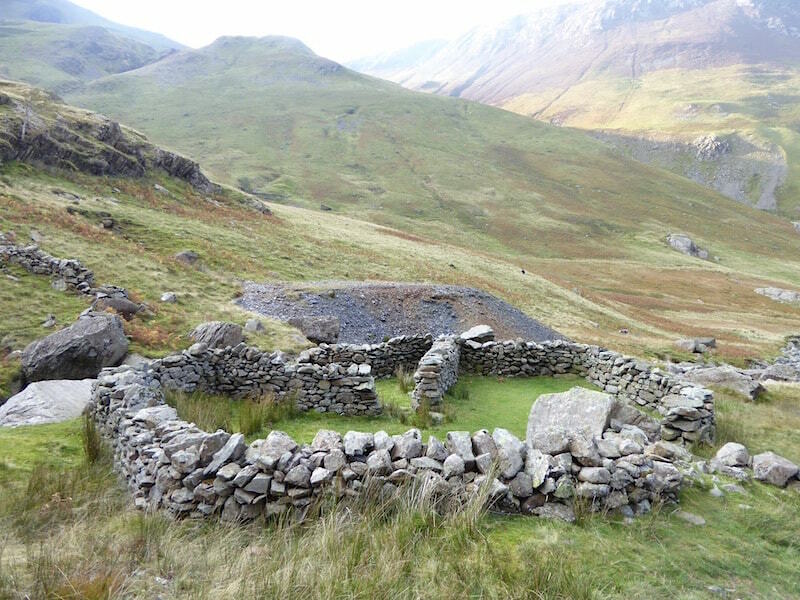 Below are some photos of them …..
One of several sheepfolds, most in ruins, we passed as we walked down the valley, this one is in good repair so it is probably still in use. 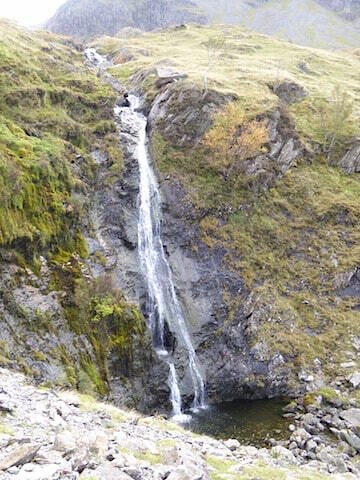 A look back at our descent route, one of the waterfalls is just visible in the centre. Lovely autumnal colours as we walk along the valley bottom. 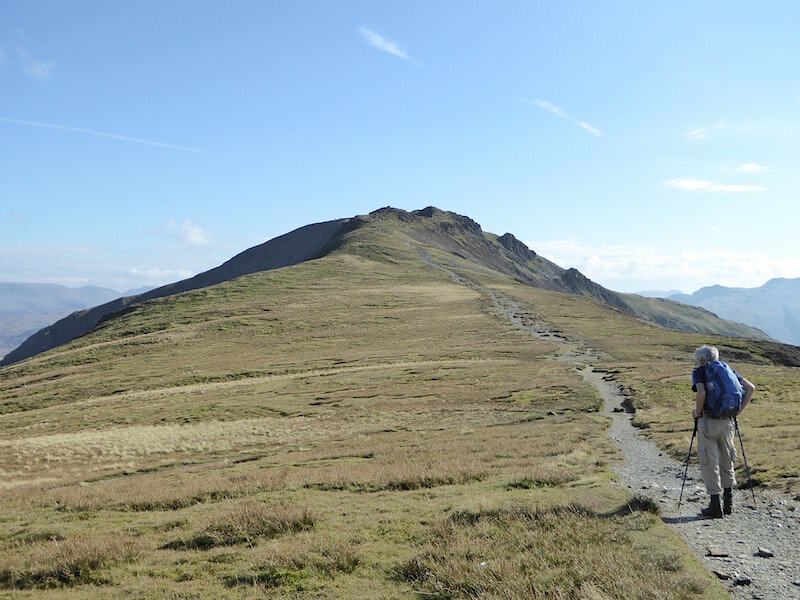 The distinctive peak of Causey Pike over on the left, we haven’t much further to go now. 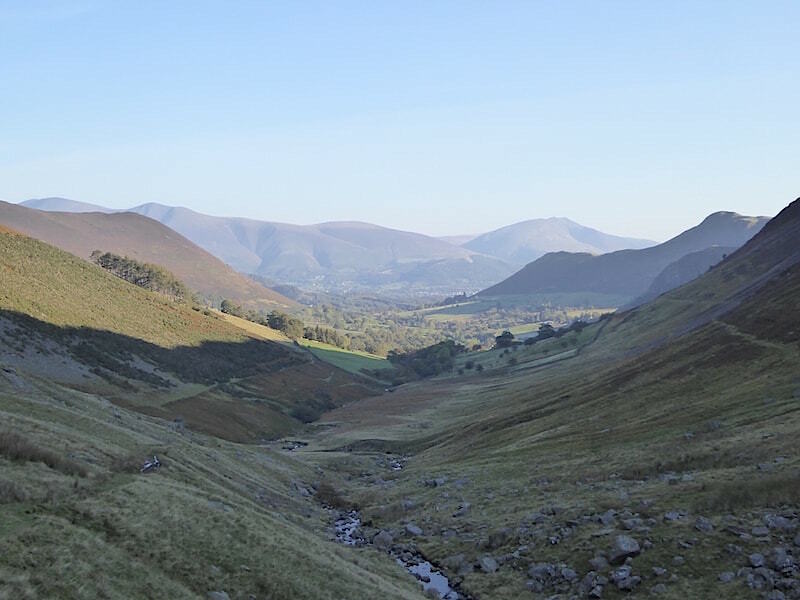 We’re only a short distance from the car now so I take a look back at the big fells at the head of the valley. 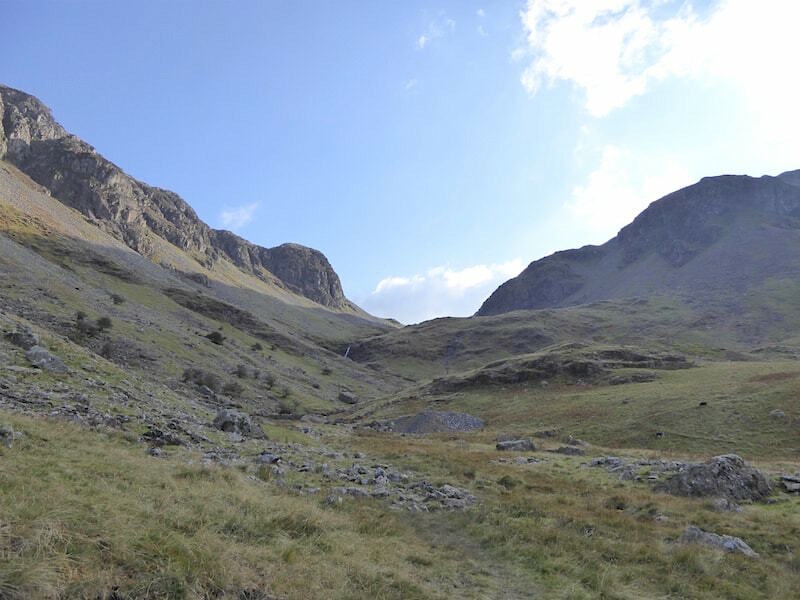 On the extreme left is Dale Head, then Hindscarth and over on the extreme right is Robinson.The cone shaped fell in the middle foreground is Scope End which forms one end of Hindscarth. Its only about 4.00 pm but already the light is beginning to go, and in a couple of weeks time the clocks go back which will reduce the daylight hours even further. 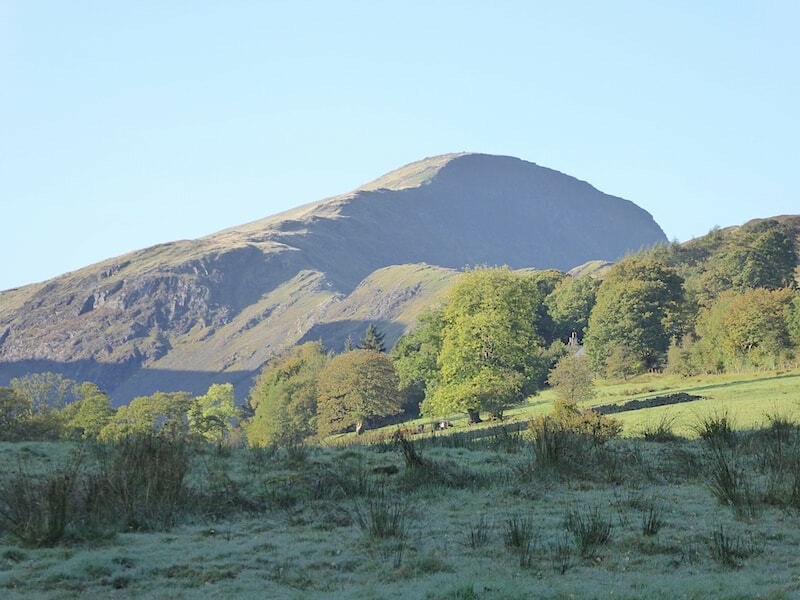 All of which means that future walks will have to be tailored to the amount of daylight available and that long summer walks are over for this year.